Wind turbines negatively affect the value of property by varying amounts depending on the proximity of the individual house to the wind farm. Five different studies concur that this drop is between 11% and 40% for homes located within 2 km of a wind farm. The pre-eminent factor in the valuation of property is location. Many international studies have found that wind farms reduce the value of property substantially and this has been acknowledged by the British Government (Davis. 2008) who has reduced property related taxes on some homes because of reduced valuations caused by wind farm proximity. A 2007 report on the impact of wind farms on house prices in the UK (Sims. 2007), authored by Dr Sally Sims and Peter Dent of Oxford Brookes University and funded by the Royal Institute of Chartered Surveyors (RICS) Education Trust, found that terraced houses within 1.6 km of a wind farm dropped by 54%, with semi-detached houses dropping by 35%. Michael McCann (2013) concurred with this finding. His study for a wind farm in Tipton County in Indiana included a literature review of 11 previous US studies. He concluded that properties within 2 kilometres of a wind farm experienced a drop of between 25% and 40%. The Lawrence Berkeley National Library (LBNL) published a report in 2013, funded by the US Department of Energy, which claimed that the property-value effect of wind farms was likely to be small on average if it is present at all. Their report was extensive and examined over 50,000 home sales in proximity to 67 different wind facilities. However, only 2.3 % of the homes were within 1.6km of a wind farm with many up to 16 km away. The report’s own data found that homes located within one mile of the turbines decreased in value by 28 percent compared to homes located within 3 to 10 miles from the turbines. McCann explained that that many industry supported reports tended to play down the impact by “Pooling data from multiple diverse locations… which tends to set wide parameters that conceal actual impacts”. We have seen this misleading practice in Ireland also, where wind developers use entire counties as a basis for comparing property. Perhaps the most comprehensive and independent study to date is that of the London School of Economics (LSE) (2013). This report, which will be launched in Spring 2014 and includes over a million property transactions, has found that larger wind farms of 20 or more turbines reduce property values by up to 12% within 2 km and by 3% at an 8 to 14 km distance. They also concluded that the amount required to compensate householders for their loss of visual amenity would be £12 million approx. for a typical 11 turbine wind farm based on the average number of households with turbines currently visible within 4 km. Importantly from an Irish perspective where many large wind farms are planned, they say; “The corresponding value for large wind farms will be much higher than this as their impact is larger and spreads out over much greater distances”. An important limitation of this study is that the average turbine in their extensive sample area was 90 metres high to tip. In Ireland, almost all planned turbines range from 130 meters to 185 meters. Sims. 2007. Oxford Brooks University. 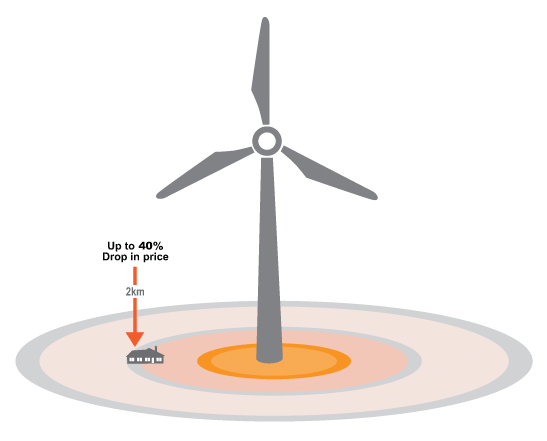 What is the impact of wind farms on house prices? View. McCann. 2013. Property value Impact and Zoning Compliance Evaluation. View. Lawrence Berkeley National Library. 2013. View. LSE. 2013. Gone with the wind: Valuing the local impacts of wind turbines through house prices. View. Royal Institute of Chartered Surveyors 2013. View.